If you’re just stopping by for the first time, this is a class in a series of classes over the next few months which will culminate in the development of a complete financial plan. Stop by HERE for a complete list of classes currently available and HERE for more information about the website. Class Objectives: To learn the essential fundamentals of time value of money including calculating present and future value. What would you say if I asked you to borrow $1,000, but that I promise that I will return that $1,000 in a year? We’re friends right? I’m a very trustworthy person, really I am! No thanks? And there you have it – time value of money is so simple in theory that even a kid can understand the concept. My daughter even understood that no one wants to loan someone money without a return. She’s going to be an accountant like her mom someday. Or a politician. Going back to loaning me that $1,000, one of the reasons that you likely would not consider that transaction is that you would have an opportunity cost of not being able to use that money for a year, namely not being able to earn a return during that time (such as interest or growth on stock investments). Another factor that comes into play is inflation: a dollar today will buy you more than it will in several years when prices increase. The last reason you may not be interested in loaning me the money is the risk that I won’t repay it later and then you’ll be out the money. Time value of money is simply the concept that money is worth more today than in the future. We would rather have money now than later. We expect that providing someone else the use of our money should result in an additional amount of money to compensate us for that time and risk of not receiving our money back. We would rather pay money later than right now. We can anticipate that someone providing us with a loan will expect to receive additional money in some form of interest that we will be required to pay. I mentioned opportunity cost above and it’s another essential component of learning about time value of money. Opportunity cost is the measured value, expressed as a percentage, of giving up a dollar today for a dollar in the future. Risk-free rate – This rate is a minimum opportunity cost assuming that you are 100% positive that you will be able to get a full return of your investment. The percentage used is generally the rate on a 3-month treasury bill. From our previous class SA301: Bank Accounts, we see that the current rate is about .32%. Risk premium – The additional interest includes the components of inflation, the default risk, the risk of the market value of investments declining and several other risks that we won’t go to in detail. This component is why someone with a credit score of 600 will not receive the same interest rate on a loan of someone with a credit score of 800. Often, the rate used for time value of money calculations for financial goals is about 7%, which is the projected after-inflation adjusted return expected for the stock market in the future. Now that we have the basics of time value of money, it will be helpful to look at specific different TVM calculations and examples to be able to further understand the concepts. There are many additional examples given in the handout for this class (linked above and previewed at the end of this class). Assume this example: Your child has just received an inheritance from a grandparent in the amount of $50,000 and you want to invest the entire sum in a 529 college savings plan, where it will grow tax-free. Any earnings will earn additional earnings on them as well as the $50,000 you deposited. You want to know how much you will have in 10 years when your child is ready to start college. You assume that your investments will earn a rate of 7% annually. Based on these assumptions, you will have $98,358 saved in your child’s 529 college savings plan. Your money is expected to nearly double! Assume this example: You are suddenly concerned about your retirement plan (or lack thereof) and decide to max out contributions to a Traditional IRA. Current maximum contributions per IRS rules are $5,500 annually with an additional $1,000 contribution allowed for those 50 and older. You want to know how much you will have when you plan to retire at age 60, which is 20 years away. You assume that your investments will earn a rate of 7% annually. Based on these assumptions, you will have $256,042 if you begin your traditional IRA savings immediately (beginning of year calulation) and $239,292 if you begin to save at the end of the year. This is a good chunk of money that can help supplement your other retirement plans and social security, which we’ll be talking about in-depth in the future. Assume this example: You have a long-term goal of accumulating $100,000 in your HSA account to cover a portion of your post-retirement health care costs. You will be retiring in 20 years and currently do not have anything invested, but plan to start this year. You assume that your investments will earn 7% per year. 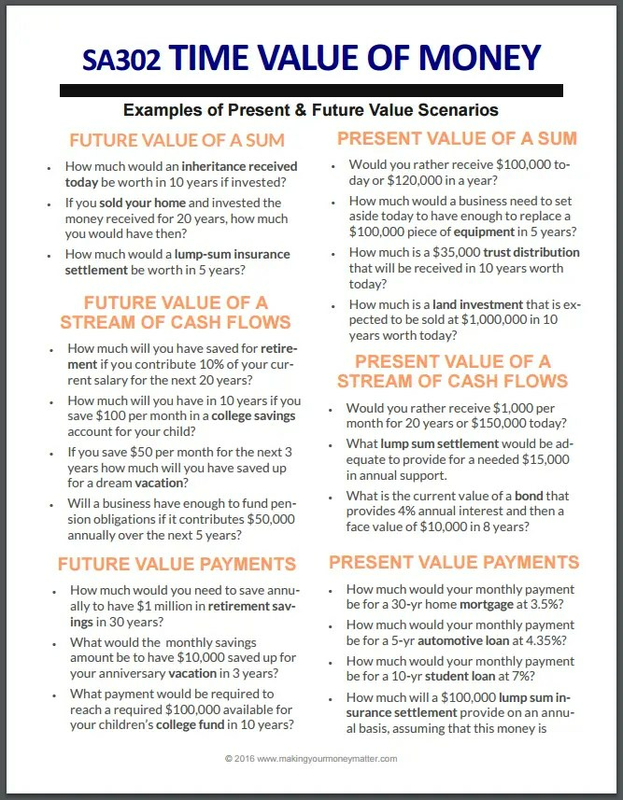 You want to know how much you need to invest over the next 20 years to be able to have that total amount of $100,000 saved. Based on these assumptions, you will need a monthly contribution of $191 or $2,280 annually if you start contributing immediately (beginning of the year). If you start your contributions at the end of the month or year, you will need $192 per month or $2,439 per year to meet the $100,000 goal. Just think of how happy you are going to be to have that money (wink, wink!). Also, are you starting to see the benefit of investing immediately? Assume this example: You are expecting that your roof will need to be replaced in 5 years and want to set aside the money today. It will cost $15,000 and you expect to earn an annual return of 5% since you will be investing in less risky investments due to the relatively short time period. How much would you need to set aside today to meet that goal? Based on these assumptions, you will need to set aside $11,753 today in investments earning 5% to have the $15,000 in cash that you need to replace your roof. That sounds like a significance difference from the $15,000, but that’s the benefit of investing. Assume this example: You are interested in investing in a rental property and want to know how much of a monetary return you will receive in the next 15 years from the investment in today’s dollars. You assume a 7% required rate of return and an annual net cash flow of $2,500 for the first 5 years, -$5,000 for the 6th year due to expected improvements and then $3,000 for the remaining 9 years. The initial investment will be $20,000. Based on these assumptions the net present value of the investment is -$57. Because this number is negative, it means that this investment will have less value than a 7% rate of return. If the investment was positive, it would mean that it returned more than 7% on the investment. Note that the actual cash inflows will be $14,500, but when they are computed to present value they are not worth nearly as much due to the time factor. A related concept to the NPV (net present value) is the IRR or internal rate of return on the investment. The internal rate of return is calculated at the bottom as the actual return that the investment is getting over the period of time. In this case, it is 6.96% which is consistent with the previous explanation that the net present value is slightly negative. This signifies that the real estate investment was earning slightly less than 7% return. Assume this example: You purchase a car for $22,000 and finance $20,000 of it through a 60-month vehicle loan with a 3.8% interest rate. You want to know what your monthly payment will be for the vehicle. Based on these assumptions you would have a monthly payment of $367. Most loan payments that you will use will be on a monthly payment basis, so you should generally ignore the annual payment option for your personal loan calculations. As another note about loan calculation, a detailed schedule that shows the breakdown of principal and interest is called a loan amortization table. We discussed it in the class DM102: Debt Reduction This schedule will allow you to see the impact of making additional principal payments in addition to your required monthly payments to see how much more quickly you can pay off your loan. Money invested grows in an exponential, not a linear fashion. The Smith family identifies a few financial goals that they would like to analyze using time value of money calculations. As shown, they would need to save $419 every month to be able to pay cash for the vehicle. GOAL #1 Update: What would the monthly payment be if they financed the car instead with $1,000 down? If they financed their vehicle based on the previously shown terms, they would have a monthly loan payment of $168. GOAL #2: Retire by age 55 with $1 million. If they want to retire by age 55 with a million dollars, they would need approximately $1,286 per month including all contributions from both Jim and his employer. This is a lofty goal and they would definitely need to find a way to increase their income significantly to be able to come anywhere close to meeting this goal. GOAL #2 Update: Retire by age 65 instead of 55 with $1 million. If they instead changed the goal to retiring 10 years later at a more traditional age of 65, the monthly requirement would go down to $488 per month. GOAL #3: Fund college savings accounts for kids in the amount of $100,000. The payments for both children are shown above. Child #1 (Emma) would need $197 per month to meet the goal and Child #2 (Jacob) would need $142 per month to be able to meet the goal. Again, this is a significant payment that would require the Smith family to significantly increase their income. In addition, they need to put their retirement goal ahead of this goal, as they can get help funding college, but will not be able to take out a loan to fund their retirement. After breaking down these goals to monthly requirements, they now know exactly what it will take to achieve them and can find ways to adjust their lifestyle to work toward them and/or adjust them as needed. Your homework assignment is to analyze your financial goals using time value of money calculations. IMPROVING – Pick your most important financial goal (may I suggest retirement?) and use the future value payment calculation spreadsheet to calculate how much you need to save on a monthly basis to reach that goal. INVESTED – Choose several of your financial goals to analyze as above. UNSTOPPABLE – Spend the time to analyze each possible financial goal that you have that uses time value of money calculations such as retirement, education planning, future home and auto purchases, vacation planning, etc. Revise your financial goals to reflect the information you receive from these calculations. I came up with some additional examples for each time value of money calculation type. This should help you when you are looking through your financial goals and need to know which spreadsheet to use to get the information you need. Click on the preview below to download. Have you used present and future value calculations before to make a plan to reach your financial goals?